Our “Costume Book” has been published on the website as well as in-hand in the lobby. Please check in the binder for pricing for your students class. The costumes are listed by Class Name, Day of Week and Time. • An Automatic Convenience Fee of $5 will be added to all balances for processing. • Clients who pay by check must be in by Thursday November 15th or are subject to a $10 late fee. Checks can be dropped off in the “Tuition” slot in the Lobby or directly onto Ms. Lauren’s Desk. • Measuring and Sizing of all students will be done in-studio during class by teachers. A form will be sent home to parents for approval. Costume Resizing/Replacements are subject to a $5 re-stocking fee. Your 2019 June Show Costume! Performance Shoes: we recommend cleaning or getting new shoes at least 6-8 weeks prior to performance. Black Tennis shoes for Hip-Hop. 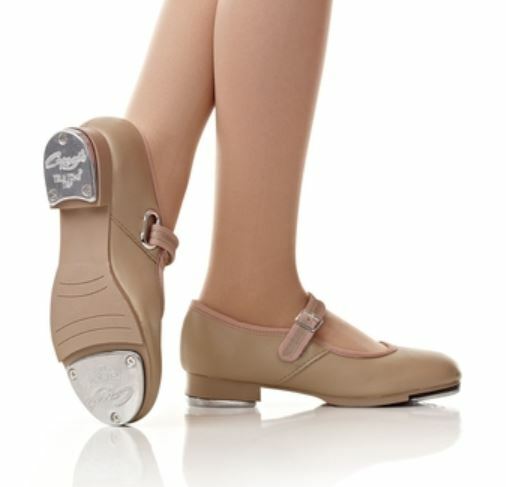 Tan Tap & Jazz Shoes. Pink Leather or Canvas Ballet Slippers. Our Online Store for Savings! Purchase online and Items ship directly to you! Visit your classes by Class Name for other great items like cool leos, leggings, tops, warm-ups & more! Shoes as low as $25!